Updated 5 p.m. | Posted 1:30 p.m. 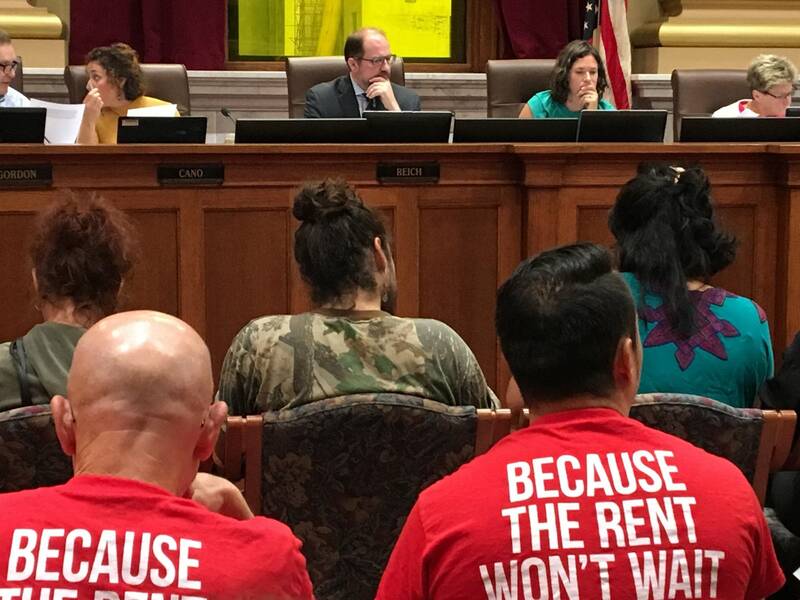 The Minneapolis City Council on Wednesday took a step toward approving a $15 an hour minimum wage requirement for city businesses. Council members amended the proposed ordinance to extend the phase-in time for small businesses from five to seven years. It appears to have enough votes for passage on Friday. Only one council member, Blong Yang, has voiced opposition. Council member Alondra Cano said she understands the need to give small businesses more time but added that it would be better to shorten the phase-in time for large companies so more workers can benefit from higher wages faster. "So, I'm generally supportive of this," she said. "I've talked to many of you how I think we should actually make large businesses move on to a four-year timeline. But the feedback that I got was just that the votes were, perhaps not there for that." Supporters say a higher wage will especially benefit low-income and people of color. Some critics, though, warn the ordinance may chase cost-conscious consumers out of the city and force Minneapolis small businesses to cut staff or reduce hours to offset the required higher wages. Council members debated nearly a dozen amendments to the proposed ordinance in front of a full council chamber. The phase-in time for small businesses was perhaps the most significant change. Instead of easing up to the $15 an hour starting wage for workers in five years, companies with under 100 employees will get seven. Council member Cam Gordon voted for the extended phase-in amendment for small businesses but said he'd rather have large companies get to $15 in four years instead of five. "I support it with some regret. I mean, there was definitely a sense that there's urgency here," Gordon said. "We need to start raising the wages of our lowest paid workers so that they can participate more fully in the economy." Under the proposed ordinance, large businesses will start paying a $10 an hour minimum wage, 50 cents above the state's minimum wage, starting next January. The first increase for small businesses would not go into effect until next July. Council members also added language to the proposed law clarifying that non-hospital health care facilities as well as programs for ex-offenders be classified as small businesses. The proposed ordinance was also amended to include a requirement that the city study the impact of the higher wage and present annual reports starting in 2019. The proposal does not include an exception for tipped workers. Restaurant industry professionals said while they support the higher minimum wage they want tips to be counted toward the $15. That way, restaurant owners can increase pay for kitchen staff without making drastic staffing changes. The lack of a tip credit and the longer phase-in for small businesses will not be good for a lot of restaurant workers, said Bryan Campbell, a server at a neighborhood restaurant in Minneapolis. "I feel like that is going to leave behind the people that actually need the raises," Campbell said. "The servers and bartenders in the restaurant industry are already making well over $15 an hour. The average server or bartender in Minneapolis makes $28 an hour." But not all tipped workers are making that amount. Catherine Olsen, a barista and counter service worker at a cafe in northeast Minneapolis, said she makes around $15 an hour with tips, but not consistently. While she earns enough to pay her bills, she said she works with people who are supporting families and could use the higher wages sooner rather than later. "There are countless workers who will be left behind, get further in debt," Olsen said. "There's a lot that can happen in seven years." Yang was the only council member who voted against the amended law in committee on Wednesday. "It will likely hurt some businesses, especially small businesses," he said. "Within the context of north Minneapolis, where I live, we have Golden Valley, Robbinsdale, Brooklyn Center, Brooklyn Park and those places that are really close by. So businesses have options that other places may not have." Yang is up for re-election this fall to retain his seat in the 5th Ward, which includes high concentrations of low-income and people of color. He acknowledged the political risk opposing the measure but said he's trying to encourage more businesses to come to north Minneapolis and the higher wage doesn't help that.